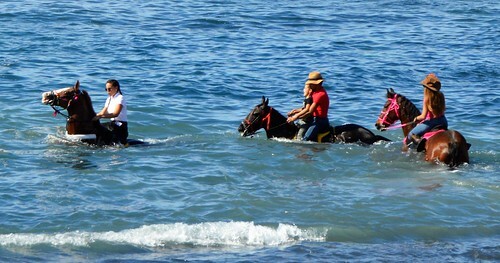 Who doesn’t like a dip in the sea, it’s refreshing, cleansing, and invigorating. 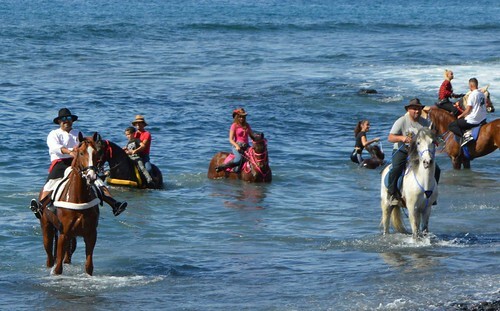 Initially wary, the horses, ponies, and even the odd camel, were soon lapping up the waves at Playa de La Enramada beach in La Caleta, Tenerife. 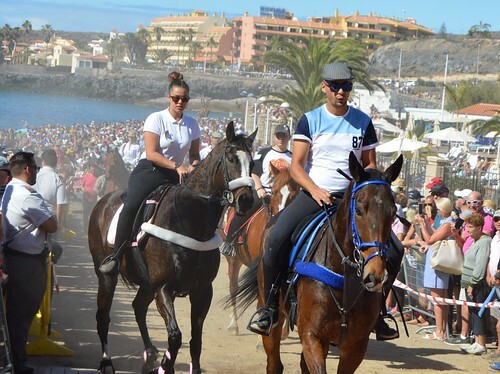 The San Sebastian fiesta is a highlight of the Adeje calendar and around 10,000 people swarmed to the church plaza and then the beach to enjoy the special day. I arrived as the peel of the church bells floated through the clear blue sky,soon to be followed by the noon mass. Outside the church terrace was packed with tables full of guitar and timple players, and giant paellas washed down with beer and wine. 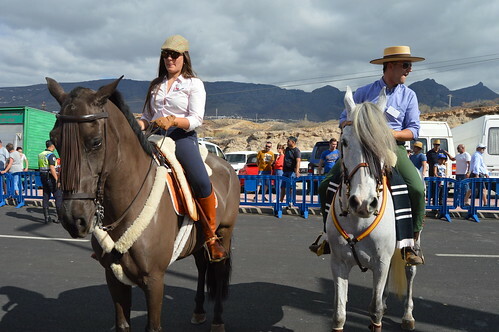 Sheep and goats roamed in their pens, and horses were groomed and decorated in the paddock area. 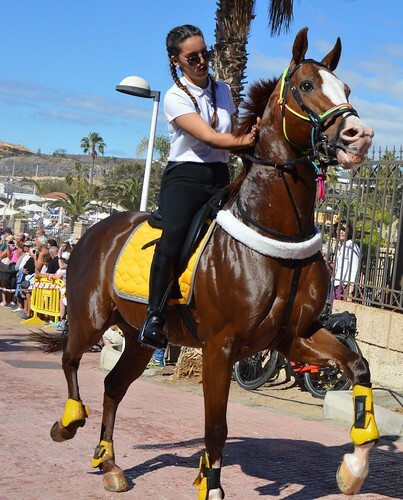 There were some magnificent looking steeds trotting through their paces on the road, there was an air of pride to them, they knew this was their big day. 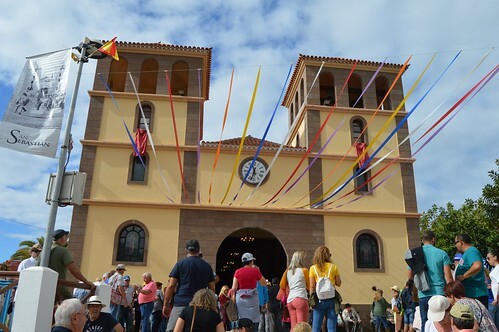 The crowds drifted down to the beach as the mass reached its conclusion, good vantage points were soon snapped up, hotel balconies brimmed with people, and para gliders swooped down from the sky. Preparations were being fine tuned, life guards and safety boats kept watch over the beach as barriers held the eager crowds back. 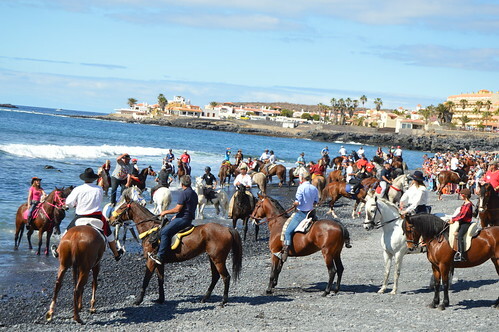 The first of the horses cantered onto the beach, a little unsure of the shifting shingle but the sea air and knowledgeable riders encouraged and coaxed them towards the shore. 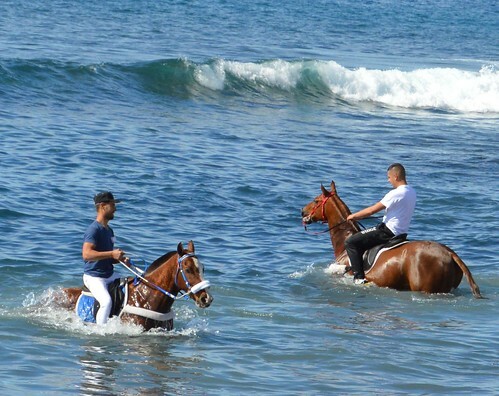 Once over their early reluctance the horses revelled in the water giving themselves and riders a good cool down. 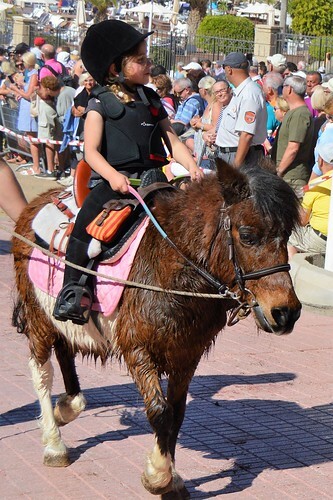 Several children either rode with adults on horses or dipped into the shallows with ponies. It was a beautiful sight, and an important cultural landmark that is lovingly preserved each year. La Caleta has come a long way from being a small fishing village, the shore side restaurants are still a magnet for those wanting to taste the local catch but the newer five star hotels loom large on the landscape. 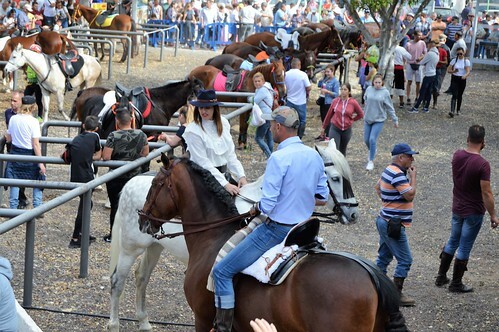 There was plenty more celebrating to be done as riders steered their horses back to steadier ground and dismounted for some well deserved food and drink. 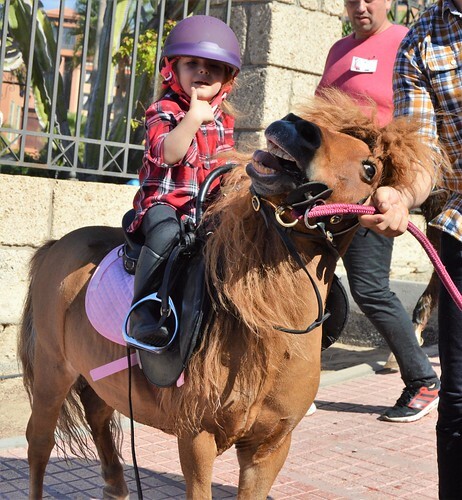 Viva San Sebastian!